I often recommend that aspiring writers read reflections on writing by successful ones. A good way to get a taste of what I mean is to read these 22 quotes from 22 celebrated authors posted at The Chive. They're all good, notably the funniest, not surprisingly, from Mark Twain; one that I have always maintained about the need to read and write from Stephen King; a reminder about the value of rewriting by Ernest Hemingway's reminder that even great writers rewrite; and G.K. Chesterton's advice on how to handle criticism. Grammar signifies more than just a person's ability to remember high school English. I've found that people who make fewer mistakes on a grammar test also make fewer mistakes when they are doing something completely unrelated to writing—like stocking shelves or labeling parts. ... I hire people who care about those details. Applicants who don't think writing is important are likely to think lots of other (important) things also aren't important. Many practical tips on grammar and usage appear in The Art of On-the-Job Writing. For the past 28 years, I have heard executives and managers tell me how they cringe when their employees abuse Standard English rules. Needless to say, those complaints increased as email grew in popularity and have become even louder as smartphones allowed us to text on the run. The Wall Street Journal reminds us of this common managerial grievance in a recent article. Some organizations go so far as screening all staff emails to clients before approving their release. Others authorize only a select few employees to write directly to clients. Still others that do not have such a luxury of limiting external communication to a chosen few applies the sensible approach of requiring all important documents to undergo peer review to detect overlooked errors in grammar, diction, punctuation, and capitalization. Of the many courses that I offer to companies, my Business Grammar workshop has generated the most interest recently. In fact, the American Management Association asked me last year to design its first AMA's Business Grammar Workshop and this year to adapt it as a live online version. Unquestionably, writers' attention to grammar reflects their attention to detail, so grammar still does matter. 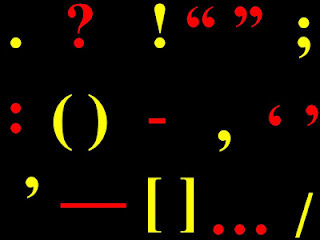 Punctuation Pointers, Part 4: Capitalize after a Colon? There is only one thing left to do now: confess while you still have time. Remember this: You must work hard to achieve your goals. Remember to bring the following items: ID card, enrollment confirmation, and flash drive.